A toddler’s appetite can sometimes seem like a bottomless pit! Their growing bodies require nourishment, and lots of it. 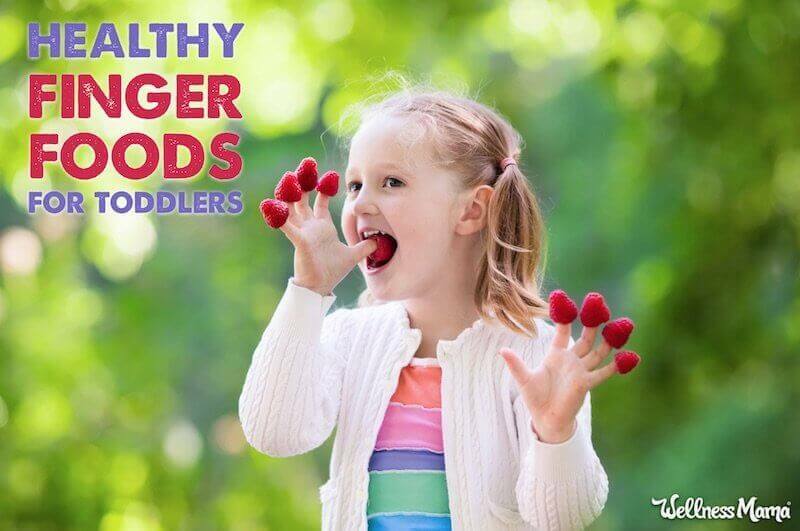 Go beyond conventional finger foods like Cheerios and baby puffs with these ideas for simple and nourishing finger foods for toddlers. I promise… even picky eaters will ask for more of these! There are few things that toddlers love more than making a mess feeding themselves! Packaged snacks for toddlers abound, but many of them are high in sugar and low on nutrition. Instead, here are some real-food, low-sugar finger foods to keep toddlers busy (and develop those taste buds in the right direction). These easy homemade kale chips have a comforting crunch like potato chips, but with a healthy twist. They’re super simple and fast to make and provide a great source of fiber and folate for little tummies. Kids love how they’re slightly salty, and I love that they’re enjoying something healthy. Sliced beets, parsnips, jicama, and other root vegetables make the perfect vehicle for a delicious dip (see below). They offer a healthy, crunchy alternative to potato chips. I haven’t made these myself yet (other than kale chips) but I love these plantain chips from Thrive Market for an easy ready-made option. It may sound like a lot to make grain-free crackers, but I promise this recipe is super simple. Just a few ingredients come together to make a crunchy snack to go with veggies, cheese, meat slices, or dip. We also love this brand when we need a ready-made option. Toddlers love nothing more than making a mess! The upside? It keeps them busy for a while! Serve finger foods with a healthy dip (and let them have at it) for a great way to get in the healthy fats kids need for development. Avocados are a fun green color for kids, and they’re full of monounsaturated fat for growing brains. Veggies like carrot, celery, cucumber, and pepper slices go well with homemade guacamole. This delicious smoked salmon dip tastes amazing enough to serve at a fancy-schmancy cocktail party, but it’s nutritious and kid-friendly enough for a toddler. I like serving it with grain-free crackers or veggie sticks for dipping… it’s like a meal in itself. I’m not talking the sugary, processed, and artificially colored gummies, but the kind with healthy blood-sugar-balancing protein! These homemade fruit snacks contain little sugar and plenty of gelatin for better skin, hair, nails, and joint health. Gelatin also is good for digestion, improves mineral absorption, and helps balances amino acids. All your toddler will taste though is a delicious, fun gummy treat! Homemade Fruit Snacks Recipe – These can be customized with whichever flavor you want by changing up the juice. 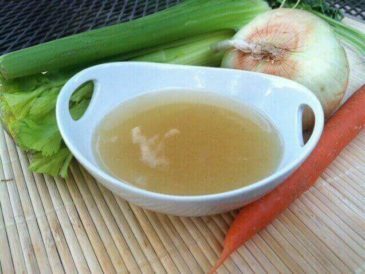 Give it an even healthier twist by using kombucha! 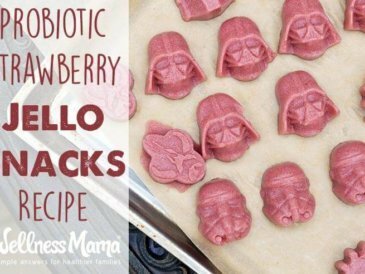 Probiotic Jello Recipe – I add homemade yogurt or milk kefir to these for a creamy, berry treat that’s rich in probiotics. Ok, so toddlers probably don’t need any more energy (! ), but these kid-friendly bars will keep them full and nourished (without processed sugar). They’re also portable. Chia Seed Energy Bar Recipe – Protein-packed and energizing chia seeds give these bars a nice crunch. I like serving these earlier in the day so they don’t interfere with bedtime. Wellness Energy Bar Recipe – My little ones actually call these candy bars, but they’re made from wholesome ingredients, like dates. Chocolate Coconut Energy Bar Recipe – These chocolate coconut energy bars are made with coconut oil and cocoa instead of sugary chocolate chips. 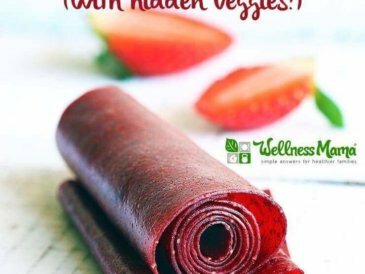 Strawberry Beet Fruit Leather Recipe – Use any fruit/veggie combination that sounds good to you, but my kids really like this flavor combination. I blend beets in with the strawberries to add iron and extra nutrition (and all the kids taste are strawberries). 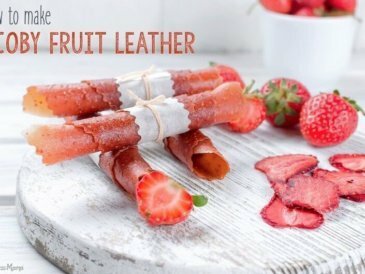 SCOBY Fruit Leather Recipe – This SCOBY fruit leather is similar to my homemade fruit leather, but with probiotics from kombucha. Skip the bread and make mini sandwiches with cucumber slices. Cream cheese, tomato slices, sliced cheese, and meat are a few filling ideas. These can also be made with sliced zucchini. My kids love stacking them and making their own combinations. Wrapping sandwich fillings in crunchy lettuce is an easy way to add extra nutrition without the grains. Chopped tomato, sliced bell peppers, shredded chicken or beef, and homemade mayo are a few filling ideas. 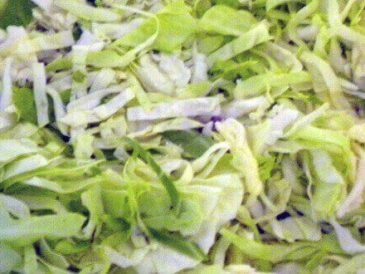 If a lettuce wrap is too hard for your toddler to hold, chop off the firmer end of some romaine lettuce or endive leaves and let them dip into homemade chicken salad or another creamy dip instead. Start the day right with these easy breakfast ideas, perfect for little hands and tummies. This recipe came about one morning when I was low on eggs for breakfast. These apple cinnamon muffins are grain-free, naturally sweetened, and portable to boot. Naturally sweetened with fruit and full of fiber and protein, these banana bread muffins could be made with a mini muffin tin to make them even more bite-sized. These breakfast burgers are sausage patties with an added boost of flavor from nutrient-dense herbs and spices. They’re a great source of protein in the morning and can be served alongside a hard boiled egg, a slice of cheese, and halved grape tomatoes for a complete toddler-friendly finger food breakfast. Layer cucumber chunks, grape tomatoes, cheese cubes, and other veggies together. Small strawberries, apple chunks and cheese cubes make a tasty fruit version. Serve with dip, like guacamole for the veggies, and a creamy fruit dip for the fruit. This healthy protein can be paired with rice pasta or spaghetti squash, but they can also be used to make meatball shish kabobs. Layer mini Greek meatballs, halved grape tomatoes, and dices of cucumber together, and serve with a tzatziki dipping sauce. Get the recipe for the Greek meatballs and tzatziki sauce here. Finding quality snacks for kids that aren’t full of sugar, cheap fillers, or harmful preservatives used to be tough, but it’s getting easier! I have my favorite homemade recipes of course, but life is a lot busier than it used to be. I make it easy on myself and save a ton of money by buying most of my kid-friendly snacks from Thrive Market. If you haven’t heard of it, think Costco wholesale pricing on Whole Foods quality foods and brands, with the convenience of purchasing through Amazon. It’s the best of all worlds and I find I save 25-50% over prices in stores and online. Thrive now even has their own brand of many food staples I buy, which saves even more! What are your favorite snacks for the little people in your life? Are there healthy options they love to eat? I’d love to hear your ideas! Many thanks to Thrive Market for sponsoring this post. For a limited time, as a Wellness Mama reader you can receive an extra 25% off your first order + a free 30-day membership! Check it out here.